One Click LCA® is approved as IMPACT-compliant by BRE. One Click LCA® is an easy to use software to measure and optimize a project’s life-cycle cost, life-cycle assessment, or embodied carbon. 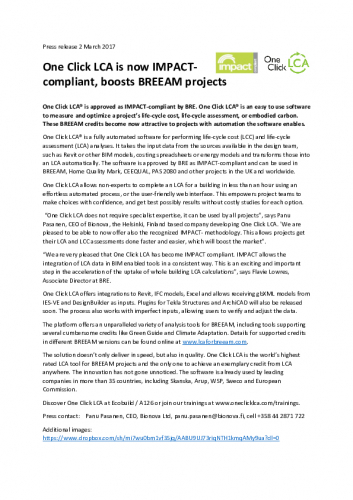 These BREEAM credits become now attractive to projects with automation the software enables. One Click LCA® is a fully automated software for performing life-cycle cost (LCC) and life-cycle assessment (LCA) analyses. It takes the input data from the sources available in the design team, such as Revit or other BIM models, costing spreadsheets or energy models and transforms those into an LCA automatically. The software is approved by BRE as IMPACT-compliant and can be used in BREEAM, Home Quality Mark, CEEQUAL, PAS 2080 and other projects in the UK and worldwide. One Click LCA allows non-experts to complete an LCA for a building in less than an hour using an effortless automated process, or the user-friendly web interface. This empowers project teams to make choices with confidence, and get best possibly results without costly studies for each option. “One Click LCA does not require specialist expertise, it can be used by all projects”, says Panu Pasanen, CEO of Bionova, the Helsinki, Finland based company developing One Click LCA. 'We are pleased to be able to now offer also the recognized IMPACT- methodology. This allows projects get their LCA and LCC assessments done faster and easier, which will boost the market”. “We are very pleased that One Click LCA has become IMPACT compliant. IMPACT allows the integration of LCA data in BIM enabled tools in a consistent way. This is an exciting and important step in the acceleration of the uptake of whole building LCA calculations”, says Flavie Lowres, Associate Director at BRE. One Click LCA offers integrations to Revit, IFC models, Excel and allows receiving gbXML models from IES-VE and DesignBuilder as inputs. Plugins for Tekla Structures and ArchiCAD will also be released soon. The process also works with imperfect inputs, allowing users to verify and adjust the data. The platform offers an unparalleled variety of analysis tools for BREEAM, including tools supporting several cumbersome credits like Green Guide and Climate Adaptation. Details for supported credits in different BREEAM versions can be found online at www.lcaforbreeam.com. The solution doesn’t only deliver in speed, but also in quality. One Click LCA is the world’s highest rated LCA tool for BREEAM projects and the only one to achieve an exemplary credit from LCA anywhere. The innovation has not gone unnoticed. The software is already used by leading companies in more than 35 countries, including Skanska, Arup, WSP, Sweco and European Commission. Discover One Click LCA at Ecobuild / A126 or join our trainings at www.oneclicklca.com/trainings. Bionova is the developer of One Click LCA and 360optimi—the leading LCA data automation and construction sector LCA cloud service respectively. These help organisations such as Skanska, WSP, European Commission’s JRC, Ramboll, Arcadis, ELAN, Saint-Gobain Weber and many others tackle life-cycle performance challenges. Bionova is based in Helsinki, Finland. Learn more abut One Click LCA at www.oneclicklca.com.